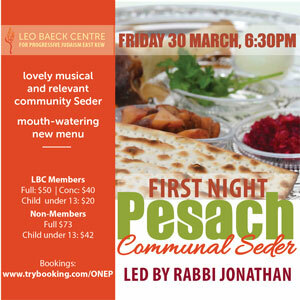 Join us as we celebrate the end of Pesach! 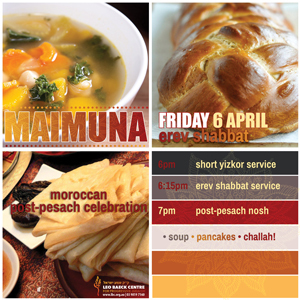 A short Yizkor service at 6pm will be followed by an Friday night Shabbat service and Maimuna, a celebration of the end of Pesach in the Moroccan Jewish tradition, with soup, Moroccan pancakes and challah!! Join us on for the Pesach I Festival Service. Special guest on the first day of Pesach is Bishop Philip Huggins, former Chair of Jewish Christian Muslim Association. 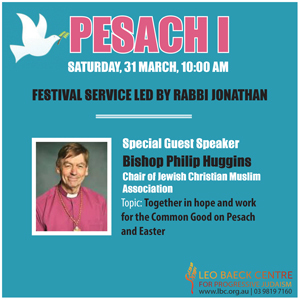 Bishop Huggins will speak on ‘Together in hope and work for the Common Good on Pesach and Easter’.